Chris Mellor has an interesting piece at The Register pointing out that while 3D NAND flash may be dense, its going to be expensive. Samsung, SanDisk/Toshiba, and Micron/Intel have already announced +$18bn investment for 3D NAND. This compares with Seagate and Western Digital’s capex totalling ~$4.3 bn over the past three years. 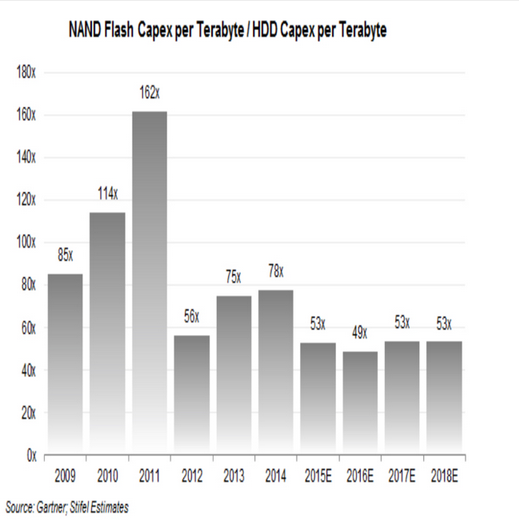 Chris has this chart, from Gartner and Stifel, comparing the annual capital expenditure per TB of storage of NAND flash and hard disk. Each TB of flash contains at least 50 times as much capital as a TB of hard disk, which means it will be a lot more expensive to buy. PS - "as cheap as chips" is a British usage.